I decided last summer that I would use Interactive Notebooks with my Algebra 1 students this year. I was nervous, but excited. Sarah Rubin's blog http://everybodyisageniusblog.blogspot.com was a lifesaver! Check her out! As I was getting started in the year, her blog was my go-to place for ideas. I hope to show some of my ideas so someone out there can use this blog, like I used Sarah's. I wanted my students to have their notebooks on day 1. I wanted them to get used to carrying them to class everyday and learning that we use, almost daily! They are an integral part of our classroom and they are valuable. That being said, I didn't have time to wait around for the "please bring your notebook by Friday" thing. I went to office depot when they had comp books for $0.25 and stocked up. On the first day of school, every student grabbed a book and we went to work! Now, one of their required supplies was a college ruled comp book to replace the one they had been given. They restocked my supply and I'm ready to go on day 1 again next year--YAY! On the first day we created a title page, taped in their syllabus and procedures, and determined their speed dial partners. Title page went on page 1 of their notebooks. They wrote their names, their phone numbers, and my name and classroom number. Hopefully if they lost their notebook it would make its way home. We then skipped 4 pages for table of contents and began numbering...1. The year had started! Page 1 had their Mastery Math Guidelines (the system our district uses), Classroom Procedures and Policies, and the Course Overview. All three of these documents were layered on one page. Students were already getting excited about their notebooks as we layered the three pages! On the top was their course overview, taped only the left side so it could flip open. Flipped open, they could read the back and also see their Policies and Procedures page. The Policies and Procedures were taped only the right so they could flip open opposite the Course Overview. 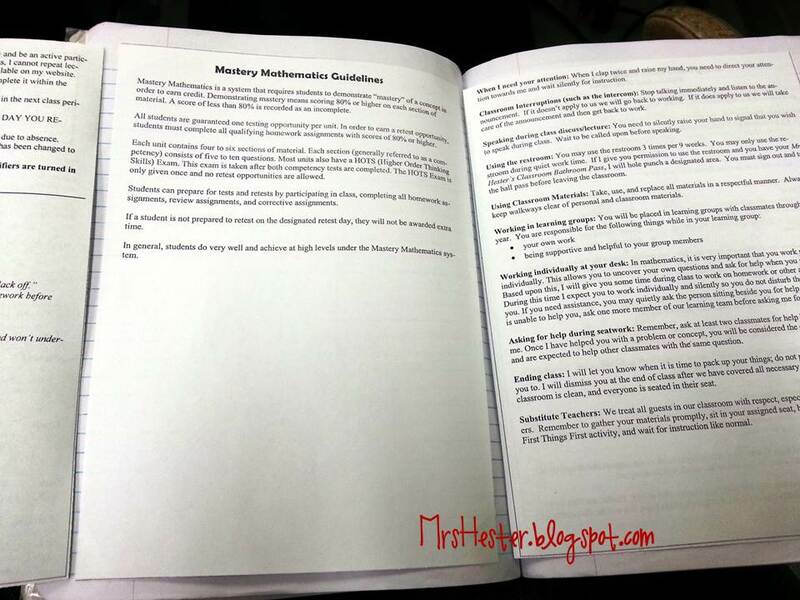 With the Policies and Procedures open, the Mastery Math Guidelines were visible. 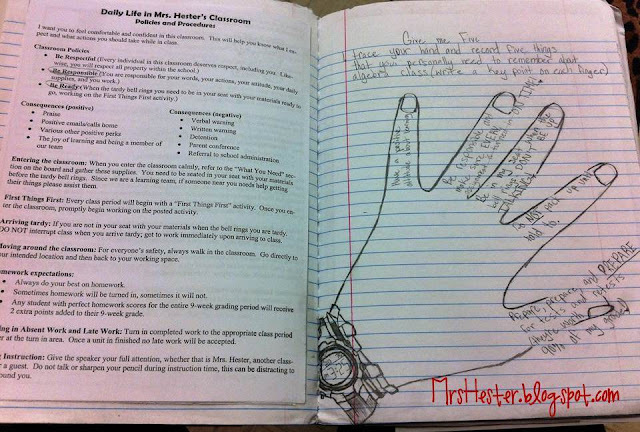 Trace their hand and write down 5 things from the pages of information that was important to them! I stressed that these should be personalized as we each struggle with different things. And, as I said above, Sarah's blog is awesome! The "Give Me 5" homework assignment was her idea, shown here. Would you believe that my students were actually excited about homework on the first day of school?! Good sign! Even 8th graders love to color and draw! Amy, no mistake. I intentionally flipped the left and right sides in my notebooks; it just made more sense to me. As students did their work on the right sides there was usually nothing underneath, like a foldable that would make their paper bubble, as there would be if they did their assignments on the left side. Also, since they almost always did their reflections or output assignments after our class notes, going left to right just made sense to me. Do what works for you!! 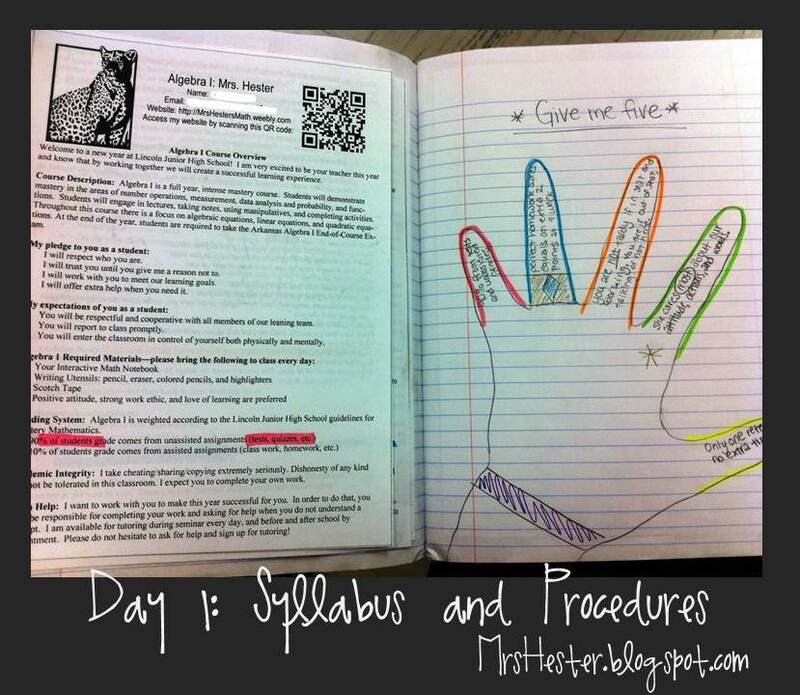 I use interactive notebooks in my classroom to and I have always had the notes on the left and work on the right, like you do. It totally makes more sense that way and for the same reason as you had side, their work gets super messy when they are trying to write over a foldable. Quick question. What does your QR code link to?? Never mind!! I actually just read the syllabus, duh!! Very nice, I am inspired by your work. 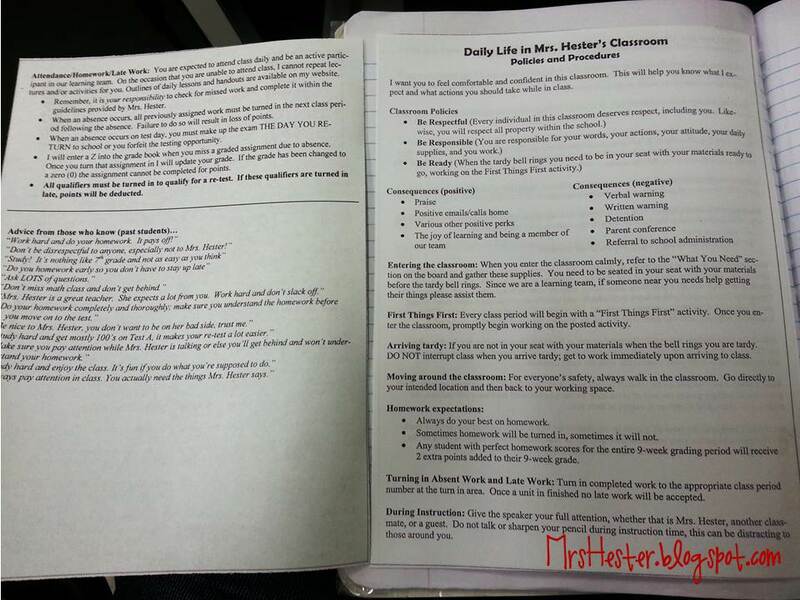 Would it be possible to get a copy of the 3 handouts that you have your students put on that first page? I would really love to see the information on those pages and hope to incorporate it into my classroom this year. I am a new teacher (only my second year) and this will by my 1st year trying the interactive notebooks. I still have a lot to learn and I am trying to learn as much from others as I can!! Please let me know and thank you ahead of time. 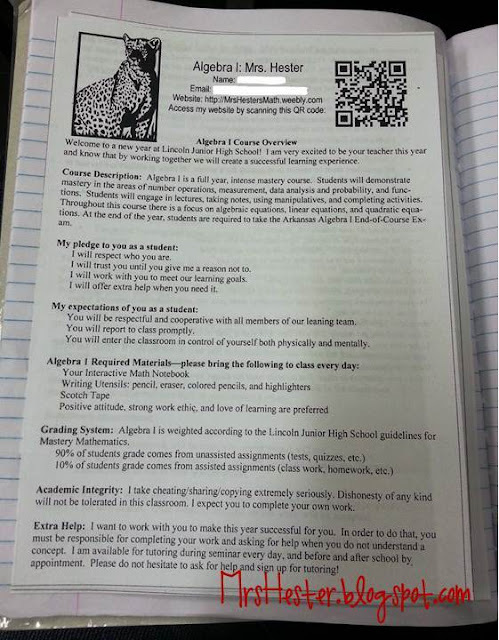 I was wondering if I could get a copy of all the handouts on this page. I would really love to tweak my syllabus and general information. I am not a new teacher, but I am new to INB's. This was my first year doing it and I love it, but I definitely need to tweak many sections. I love EVERYTHING that I've seen. I would like to see the three handouts that you gave the students. This us my first year as a teacher. My desire is to get my students off to a great start and to give them the tools to create their own when they move on next year.